The term pneumoperitoneum refers to the presence of air within the peritoneal cavity. The most common cause is a perforation of the abdominal viscus—most commonly, a perforated ulcer, although a pneumoperitoneum may occur as a result of perforation of any part of the bowel; other causes include a benign ulcer, a tumor, or trauma. The exception is a perforated appendix, which seldom causes a pneumoperitoneum. The presence of a pneumoperitoneum does not, however, always imply a perforation, because a number of other (mostly nonsurgical) conditions are associated with pneumoperitoneum. Likewise, not every bowel perforation results in a pneumoperitoneum; some perforations seal over, allowing little gas to escape. A pneumoperitoneum is common after abdominal surgery; it usually resolves 3-6 days after surgery, although it may persist for as long as 24 days after surgery. The peritoneum is a thin, serous membrane that lines the abdominal cavity. It has parietal and visceral layers, the latter being reflected over the abdominal viscera. A thin layer of serous fluid, which acts as a lubricant, separates the 2 layers. Several intra-abdominal organs are invaginated by visceral peritoneum to such an extent that they are almost completely covered by peritoneum; they have double layers of peritoneum within them as mesenteries and ligaments (see the images below). Pneumoperitoneum. 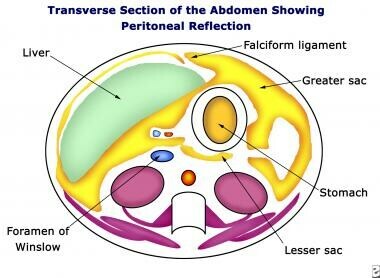 Diagram of transverse section of the abdomen shows peritoneal reflection. Pneumoperitoneum. Diagram of a sagittal section of the female abdomen and pelvis shows peritoneal reflection. Pneumoperitoneum. Diagrams of the right upper quadrant show the location of the oblong collection of air in the right subhepatic space seen on a plain supine abdominal radiograph. Pneumoperitoneum. Diagram of the right upper quadrant shows a triangle-shaped collection of air in the Morison pouch, as seen on a plain supine abdominal radiograph. This collection is usually bound by the 11th rib, and it may be triangular (doge's cap), crescent shaped, or semicircular. Pneumoperitoneum. Diagram of the right upper quadrant shows the location of a circular collection of air projected over the liver interposed between the anterior liver surface and the anterior thoracic and abdominal wall seen on a plain supine abdominal radiograph. The most common cause of a spontaneous pneumoperitoneum is the introduction of air through the female genital tract (see the images below). Pneumoperitoneum. Upright chest radiograph shows a large pneumoperitoneum outlining the spleen and the superior surface of the liver. Pneumoperitoneum. (Left) Sagittal sonogram through the liver shows a comet-shaped artifact due to free air in the anterior subphrenic space, which causes shadowing. Also note the free peritoneal fluid. (Right) A transverse oblique sonogram through the midabdomen shows dilated loops of small bowel with a streak of free fluid between the bowel loops. Pneumoperitoneum. Contrast-enhanced axial CT scan through the liver shows a collection of air anterior to the liver. Also note the air surrounding the gallbladder and the leakage of water-soluble contrast material from a perforated duodenal ulcer. 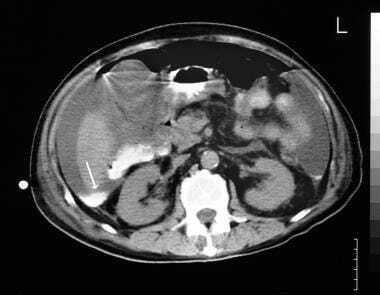 CT is regarded as the criterion standard for the detection of a pneumoperitoneum; it provides exquisite scans, and it is theoretically more sensitive than plain abdominal radiography. However, CT is not always required when a pneumoperitoneum is suspected. Despite the contrary consensus, the accuracy of supine abdominal radiography closely approximates CT when the entire abdomen is imaged. Free intraperitoneal air is often missed with plain radiology. The failure to detect free air is more a function of lacking standardization and of inadequate technique. In most institutions, a kidney, ureter, bladder (KUB) image is used instead of other images in cases of suspected pneumoperitoneum. 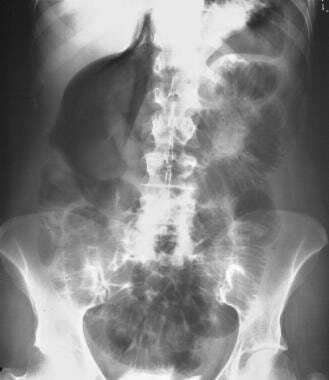 These radiographs are insufficient for the diagnosis of a pneumoperitoneum because the uppermost portion of the peritoneal cavity, which reveals important signs, may be excluded from the examination. If proper technique is applied, contrast-enhanced studies and CT scanning can be avoided. Although a CT scan is considered a criterion standard in the diagnosis of a pneumoperitoneum, it is expensive in terms of both radiation burden and cost. With both conventional radiology and CT, oral contrast material is used to opacify the lumen of the GI tract and to demonstrate a bowel leak. The leak may be too small, or it may have sealed, and extravasation of the contrast material may not occur. When a distal small or large bowel perforation is suspected, one major limitation of the use of oral contrast material is that several hours may be required to opacify the bowel. Thus, the randomness of bowel opacification, the difficulty encountered in securing the cooperation of a sick patient, and the relative clinical urgency for diagnosis limit the value of oral contrast enhancement. Abnormal abdominal gas collections are classified according to the anatomic location, which is often the key to the differential diagnosis. Extraluminal gas may be involved in pneumoperitoneum or gas within an abscess or fistulous tract. Gas within a pelvic abscess usually indicates that the abscess is of GI origin. Gas within an abscess of pelvic inflammatory disease (PID) is unusual. Gas within the paracolic gutter is usually associated with GI perforation. Diverticulitis may produce extraluminal gas trapped within the adjacent mesentery. Intraluminal gas may be normal or abnormal. The gas may be intratumoral (within a neoplasm in association with infection or bowel communication), intramural, within a paralyzed loop of bowel, within an obstructed Meckel diverticulum (secondary infection), or within the biliary tree. 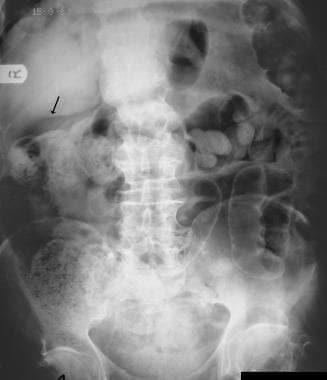 Normal intraluminal gas can be differentiated by the presence of gas within the bowel lumen in association with peristalsis that is visible on fluoroscopy or ultrasonography (US). Within the portal vein, intraparenchymal gas may sometimes be seen on real-time US as gas microbubbles moving through the liver or as linear collections of hyperlucent branching gas at the periphery of the liver. Gas may be seen in a liver abscess. The differential diagnosis between liver microabscesses and microcalcification may be difficult to make with US. In most other organs, intraparenchymal gas usually indicates an abscess. Intratumoral gas typically occurs in a gastric leiomyoma or leiomyosarcoma; in such cases, the gas may be seen extending from the lumen of the stomach into the tumor. Intratumoral gas may also be seen in hepatic tumors after chemoembolization; in such cases, differentiation of the gas from an abscess may be difficult with the use of images alone. Intramural gas may be related to ischemia. US features that are distinctive of infection include high-amplitude echoes that do not change with the patient's position or with peristalsis. Adjacent bowel wall thickening is often present. Crohn disease and cytomegalovirus (CMV) infection are less common causes of intramural bowel gas. Pneumatosis coli is often better shown with CT than with US. Acute emphysematous cholecystitis, which often occurs in diabetic patients and the elderly, shows evidence of intramural gas on US. Confusion may occur with mural calcification, which is often curvilinear but which does not have the characteristic ring-down artifact associated with air bubbles. Adenomyosis of the gallbladder may cause a comet-tail artifact. 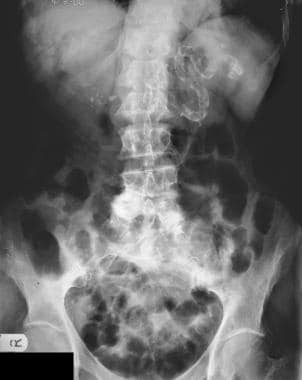 The presence of free intra-abdominal gas usually indicates a perforated abdominal viscus. The most common cause is perforation of a peptic ulcer. Patients with such conditions need urgent surgery. Occasionally, patients with vague abdominal symptoms have unequivocal features of a pneumoperitoneum, but there is little clinical evidence of peritonism. These patients have a pneumoperitoneum without peritonitis. They are treated expectantly and do not require surgery. In males, the peritoneal cavity is completely closed, but in females, the peritoneal cavity communicates with the genital tract via the fallopian tubes, which provide a potential pathway for suction of air into the peritoneal cavity. The fallopian tubes also constitute a possible pathway of infection from the genital tract. 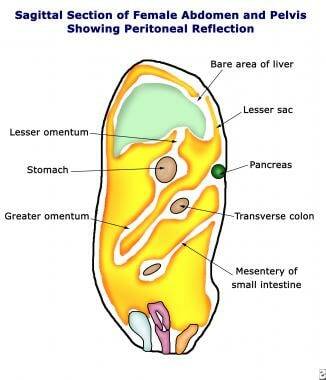 Various peritoneal reflections and ligaments interrupt the peritoneal cavity. At the level of the umbilicus, the obliterated fetal urachus (median umbilical cord) forms a shallow ridge that extends cephalad from the dome of the urinary bladder to the umbilicus. The median umbilical cords, which represent the obliterated umbilical arteries, extend from the internal iliac arteries to the umbilicus in the shape of an inverted V.
The falciform ligament is a double layer of peritoneum that forms anteriorly near the midline between the umbilicus and the esophagus. It passes backward and splits to enclose the liver. Superiorly, peritoneal layers form the triangular and coronary ligaments, which enclose the bare area of the liver. The layers of peritoneum investing the liver unite on its visceral surface to form the lesser omentum, which passes from the liver to the esophagus, the stomach, and the first part of the duodenum. The free edge of the lesser omentum between the porta hepatis and duodenum contains the portal vein; the hepatic artery and common bile duct lie anteromedially and anterolaterally, respectively. The layers of the lesser omentum split to enclose the stomach and then reunite to form the greater omentum and gastrosplenic and lienorenal ligaments. In the free edge of the falciform ligament lies the ligamentum teres (the obliterated fetal left umbilical vein), which passes into the groove between the quadrate lobe and the left lobe of the liver. The transverse colon is enclosed by the transverse mesocolon, which is attached posteriorly to the anterior aspect of the pancreas. The lesser sac lies behind the lesser omentum and the stomach. The spleen, which is attached by the gastrosplenic and lienorenal ligaments, forms the left wall of the lesser sac. The right of the sac communicates with the main peritoneal cavity via the foramen of Winslow. These reflections and peritoneal spaces are important radiologically because it is here that air accumulates in a pneumoperitoneum. Most pregnant women (90%) experience significant improvement or complete resolution of peptic ulcer disease. Complications of peptic ulcer disease such as hemorrhage and perforation are rare in pregnancy. Radiology has a role in the evaluation of suspected perforation, but the use of conventional radiography involves irradiation of the fetus. With lateral chest radiography, the fetus is excluded from the direct beam. US is readily available in most centers and can be used in the pregnant patient. 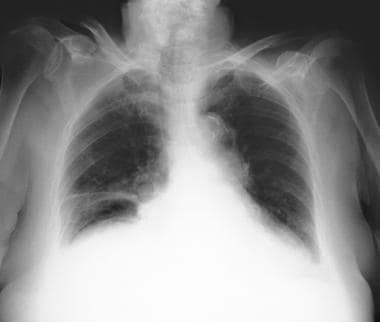 In a series of 100 patients, Woodring and Heiser found that use of upright lateral chest radiographs led to a confirmation of pneumoperitoneum in 98% of patients  ; by contrast, use of standard upright posteroanterior (PA) radiographs resulted in a confirmation in only 80% of patients, suggesting that upright lateral views are more sensitive than standard upright PA chest radiographs. Negative findings support conservative management. For cases in which there is strong clinical suspicion but the radiographic findings are negative, the decision to use further imaging such as CT or to perform surgical exploration must be made on an individual basis. 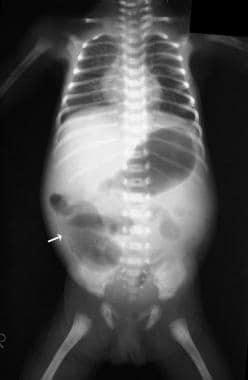 Although a negative lateral chest radiograph excludes a pneumoperitoneum in most cases, the physician should not hesitate to perform a full abdominal series when the index of clinical suspicion is high; in such instances, the benefit outweighs the disadvantage of the small radiation dose to the fetus. Optimal radiographic technique is important with a suspected abdominal perforation. At least 2 radiographs should be obtained, including a supine abdominal radiograph and either an erect chest image or a left lateral decubitus image. The patient should remain in position for 5-10 minutes before a horizontal-beam radiograph is acquired. A lateral chest x-ray has been found to be even more sensitive for the diagnosis of pneumoperitoneum than an erect chest x-ray. The images below depict radiographic technique. Pneumoperitoneum. 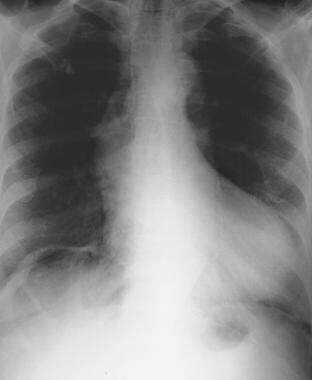 Plain radiograph of the right upper quadrant shows a tiny streak of air under the diaphragm due to a pneumoperitoneum. Pneumoperitoneum. Upright chest radiograph shows a large collection of air under both hemidiaphragms due to perforated duodenal ulcer. Pneumoperitoneum. Images in a 24-year-old man known to have Crohn disease who presented with acute abdominal pain. (Left) Supine radiograph of the right upper quadrant shows a vague lucency overlying the liver. (Right) Lateral decubitus radiograph shows an obvious pneumoperitoneum. Note also the air-fluid levels within the bowel due to associated ileus. At surgery, a perforated terminal ileum secondary to Crohn disease was diagnosed. Pneumoperitoneum. This elderly patient was knocked down by a car in a motor vehicle accident. Her main complaint was hip pain. 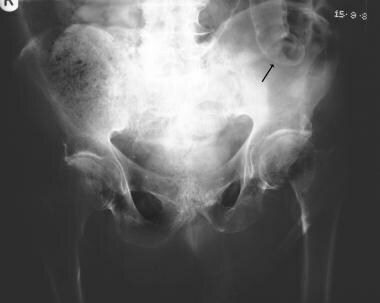 Plain abdominal radiograph of the pelvis confirms the presence of a fracture of the neck of the left femur, but also note a bowel relief sign (arrow). At surgery, a perforation of the small bowel secondary to blunt abdominal trauma was confirmed. Pneumoperitoneum. Coned view of the lower abdomen shows the lateral umbilicus sign (arrow), which is a sign of a large pneumoperitoneum on a plain abdominal radiograph. Note also the bowel relief sign. Pneumoperitoneum. Coned view of the lower abdomen shows the urachus sign (arrows), which is another sign of a large pneumoperitoneum on a plain abdominal radiograph. Pneumoperitoneum. Supine abdominal radiograph shows an elliptical collection of air within the subhepatic space. Note also the bowel relief sign. Pneumoperitoneum. Plain abdominal radiograph of a patient with a pneumoperitoneum shows a triangular collection of air in the Morison pouch (solid arrows). Also note the bowel relief sign (open arrows). Pneumoperitoneum. 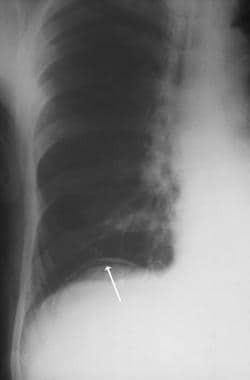 (Left) Supine chest radiograph shows a tiny collection of air under the diaphragm (arrow) in a patient with pneumoperitoneum. (Right) Supine abdominal radiograph shows a triangular collection of air in the Morison pouch (arrow). Pneumoperitoneum. A 66-year-old man was admitted to the hospital with urinary retention and was being examined for prostatic pathology. While he was in the ward, he had a sudden onset of acute abdominal pain. 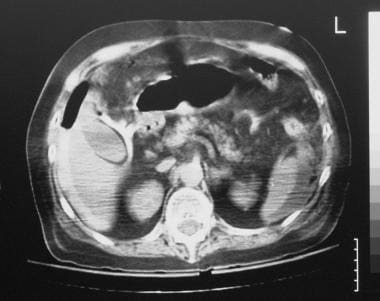 Findings on this supine radiograph were interpreted as being normal, but note the pear-shaped lucency projected over the liver indicative of a pneumoperitoneum. Pneumoperitoneum. A 49-year-old man was admitted to the hospital with acute abdominal pain. 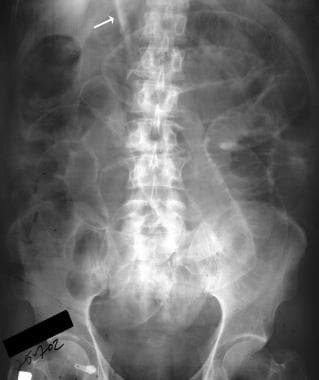 Findings from the initial plain abdominal radiographs were interpreted as being normal. Because the cause of his abdominal pain was not clear, an upper GI series performed with water-soluble contrast material was requested. (Left) Radiograph obtained early in the study shows no leakage, but note the triangular collection of air within the Morison pouch. (Right) When this earlier plain radiograph was interpreted, the collection of air within the Morison pouch was seen; this had escaped detection earlier (arrow). Pneumoperitoneum. 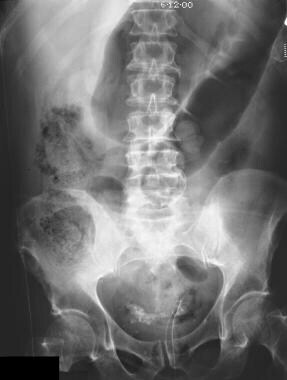 Supine abdominal radiograph in a 26-year-old man with known Crohn disease who presented with acute abdominal pain. Findings on the initial plain radiographs were interpreted as normal. Radiograph shows barium within the stomach, but note air within the lesser sac and in the Morison pouch. At surgery, a perforated duodenal ulcer was confirmed. Pneumoperitoneum. Supine abdominal radiograph shows a falciform ligament (arrow). Pneumoperitoneum. 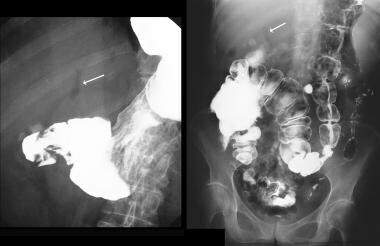 (Left) Upper GI barium series in a patient who presented with acute abdominal pain. Note the duodenal ulcer crater and air within the ligamentum teres (arrow). (Right) Follow-up barium study shows that the barium leak and air within the ligamentum teres (arrow) persists. Pneumoperitoneum. 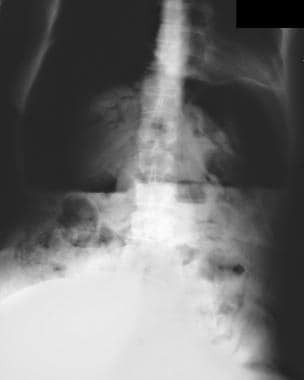 Plain abdominal radiograph in a 24-year-old man who presented with acute abdominal pain 24 hours after undergoing an upper GI series with barium. Radiography was performed to evaluate peptic ulcer disease. Note that barium has been released into the anterior subphrenic space (arrows). Note also the delineation of the falciform ligament of the escaped barium. 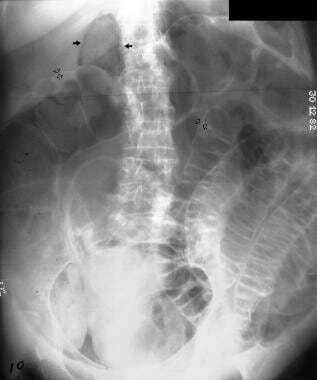 Also seen is barium within the grooves of mesenteric vessels (arrows). The bowel relief sign is obvious. Pneumoperitoneum. 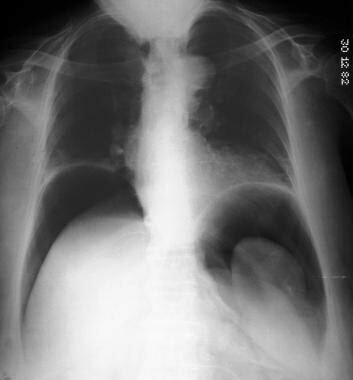 Left, Posteroanterior (PA) chest radiograph in a patient receiving long-term steroid therapy who presented with breathlessness but no abdominal symptoms. A large pneumoperitoneum is present, and because of the lack of abdominal signs, she was observed. 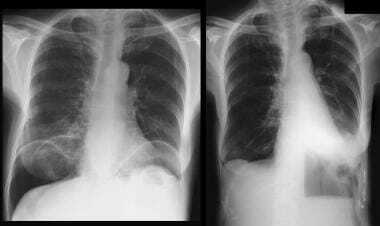 (Right) Two weeks later, a repeat anteroposterior (AP) chest radiograph was obtained because the patient felt vaguely unwell, although she had no abdominal signs. Note the air-fluid level to the left of the upper lumbar spine and left basal pleural effusion. At surgery, a retroperitoneal abscess secondary to a colonic perforation was diagnosed. Patients who are diabetic or those taking steroids are prone to silent perforations. Pneumoperitoneum. This patient was unwell after endoscopic retrograde cholangiopancreatography (ERCP). 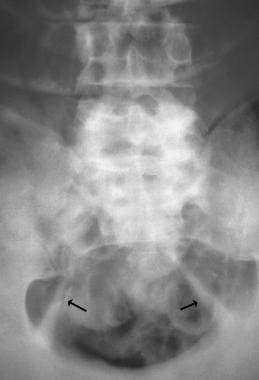 Plain abdominal radiograph shows a falciform ligament (arrow) and the bowel relief sign. The patient was treated conservatively because of a lack of abdominal signs. He recovered fully. Pneumoperitoneum. 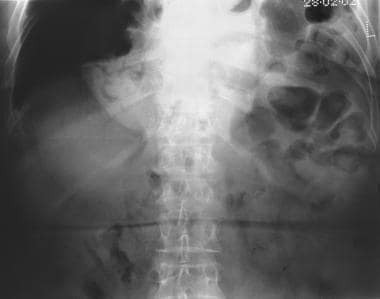 Plain abdominal radiograph in a patient in whom a retropneumoperitoneum developed after endoscopic retrograde cholangiopancreatography (ERCP). Pneumoretroperitoneum. 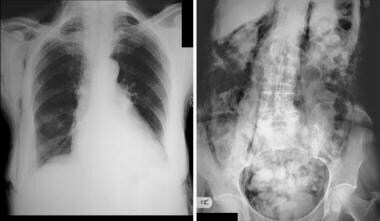 Chest radiograph (left) and plain radiograph (right) show surgical emphysema and retroperitoneal air secondary to a retroperitoneal bowel perforation. Pneumoperitoneum. Image shows bowel perforation after bowel infarction. Note the large pneumoperitoneum and air within the portal venous radicals. Pneumoperitoneum, mimics. Pneumatosis coli secondary to necrotizing enterocolitis. Pneumoperitoneum, mimics. 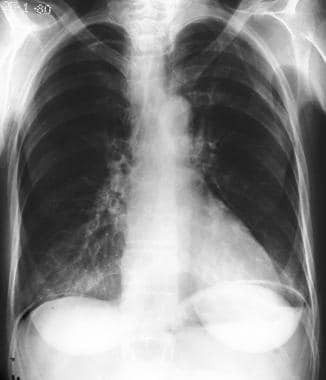 Plate atelectasis at the right lung base mimics a small pneumoperitoneum. Pneumoperitoneum, mimics. Large bulla at the base of the right lung mimics a large pneumoperitoneum. Pneumoperitoneum, mimics. Image shows colonic interposition. Note the haustra. Pneumoperitoneum, mimics. 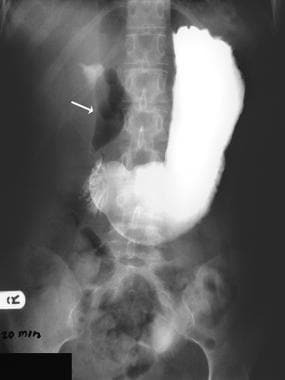 Air-containing bowel loops within a Morgagni hernia. Pneumoperitoneum, mimics. Air within the portal venous radicals secondary to bowel infarction is an ominous sign in adult patients. Pneumoperitoneum, mimics. Image shows air within the biliary tree after papillotomy. Some authors suggest a complete free-air series, which includes the acquisition of a left lateral decubitus image after the patient is in the proper position for 20 minutes and the acquisition of an upright radiograph after 5 minutes and a supine radiograph after 1 minute. The total examination time is therefore 26 minutes, which becomes cumbersome for patients who are ill and in pain. The football sign, which usually represents a large collection of air within the greater sac. The air seems to outline the entire abdominal cavity. Some authorities apply the term football sign to the air surrounding the falciform ligament, which looks like the laces of a football. The gas-relief sign, the Rigler sign, and the double-wall sign are all terms applied to the visualization of the outer wall of bowel loops caused by gas outside the bowel loop and normal intraluminal gas. 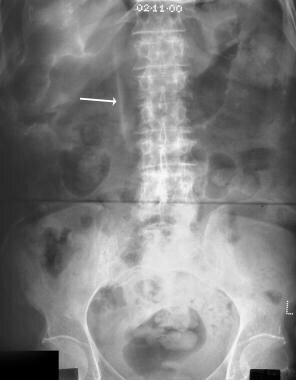 Free intraperitoneal gas and intraperitoneal fluid in excess of 1000 mL are usually required to elicit this sign. 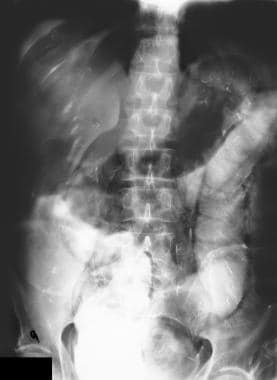 The urachus is a vestigial peritoneal reflection not normally seen on a plain abdominal radiograph. It has the same opacity as other soft tissue intra-abdominal structures, but when a pneumoperitoneum occurs, air outlines the urachus. The urachus is then seen as a thin midline linear structure in the lower abdomen proceeding cephalad from the dome of the urinary bladder. The base of the urachus may be slightly thicker than the apex. 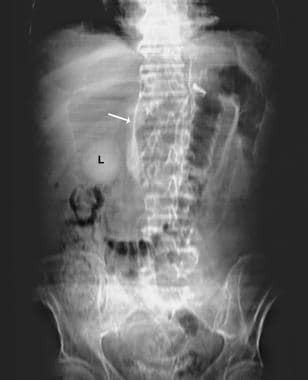 The lateral umbilical ligaments, which contain the inferior epigastric vessels, may become visible as an inverted V sign in the pelvis as a result of a large pneumoperitoneum. A telltale triangle sign represents a triangular pocket of air between 2 loops of bowel and the abdominal wall. Scrotal air may be seen in children as a result of peritoneal intrascrotal extension (through patent process vaginalis). Free air under the diaphragm may depict the diaphragmatic muscle slips as arcuate soft tissue bands, arching parallel to the diaphragmatic dome. Gas within the lesser sac may be present, particularly with a perforation of the posterior wall of the stomach. 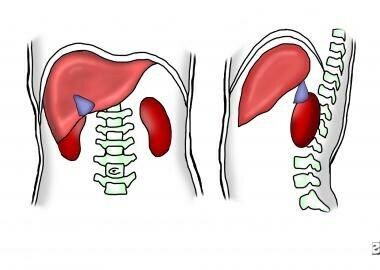 Air may be present around the spleen. 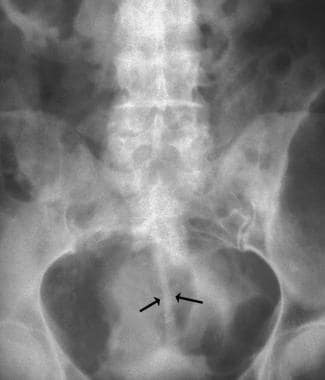 Signs of partial large bowel obstruction with a sigmoid diverticulum perforation may occur in association with signs of a pneumoperitoneum. On a left lateral decubitus radiograph, free air is apparent around the inferior edge of the liver, which forms the least dependent part of the abdomen in that position. In obese patients, particularly women, the least dependent part may be overlying the hips, a point at which free air may be present. A round, oval, or pear-shaped collection of air may be projected over the liver shadow between the ventral liver surface and the anterior thoracic or abdominal wall (anterior superior oval sign). This collection may be solitary or present in several smaller locules. The liver shadow normally has no gas overlying it, though such gas does occur in association with the following conditions: colonic interposition, subphrenic abscess, liver abscess with gas-forming organisms, the presence of portal venous gas, the presence of biliary gas, and as an effect of chemoembolization. An oblong saucer-shaped or cigar-shaped collection of air may be present in the subhepatic space inferior to the lower edge of the liver. A triangular collection of air may be seen in the Morrison pouch, which is bound by the left 11th rib. The configuration of this air collection varies and may be semicircular, crescent shaped, or triangular. This has been likened to a doge's cap. Parahepatic gas bubbles may be seen lateral to the right edge of the liver. The cupola sign (saddlebag or moustache sign) represents gas trapped under the central tendon of the diaphragm. Small collections of air around the periduodenal area normally occur with a retroperitoneal perforation in the second part of the duodenum, but it has also been described with a pneumoperitoneum. The falciform ligament is a linear soft tissue opacity coursing vertically between the umbilicus and the ligamentum teres notch in the inferior surface of the liver. The falciform ligament may be thin and of uniform diameter, but it is occasionally a linear lobulated structure that may be several millimeters thick. Gas within the ligamentum teres notch may be seen as an inverted V–shaped collection on the undersurface of the liver at the junction of the right and left lobes. Gas within the ligamentum teres is seen as a vertical slitlike or oval lucency lying between the 11th and 12th right ribs and 2.5-4 cm lateral to the spinal edge. The gas collection may be 2-7 mm wide and 6-20 mm long. Air in the gallbladder fossa is a recently described sign that is better demonstrated with CT than with radiography. Not infrequently, patients with an acute abdomen and suspected perforation have no free gas, as assessed on plain radiographs. The differential diagnosis usually includes acute cholecystitis, pancreatitis, and a perforated ulcer. To aid in the examination, about 50 mL of water-soluble contrast agent is given orally or via a nasogastric tube with the patient lying right-side down. Fluoroscopy may be used to examine the patient; spot images are obtained after the patient stays in the right lateral decubitus position. In patients with a perforated ulcer, contrast material may leak into the peritoneum. 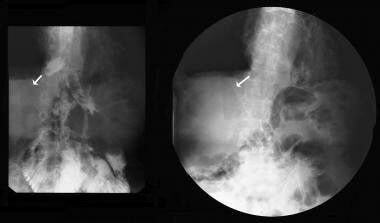 Fluoroscopy is not always essential, and plain abdominal radiography may be performed. Patients with pancreatitis may also be examined with this technique; in these patients, an edematous, stretched duodenal loop may be visualized. The use of ionic water-soluble contrast medium should be avoided because patients may inadvertently inhale it. Plain radiography remains the mainstay in imaging an acute abdomen, including a perforated abdominal viscus. As little as 1 mL of free gas can be detected on a plain radiograph—either an erect chest image or a left lateral decubitus abdominal image. Pneumoperitoneum is detectable in 56% of patients by using a supine abdominal image. In approximately one half of patients with a pneumoperitoneum, gas overlies the right upper quadrant. Pneumoperitoneum. Nonenhanced axial CT through the tip of the liver shows leakage of oral contrast material (arrows) from a perforated gastric ulcer. Pneumoperitoneum: Posterior perforation of a duodenal ulcer showing inflammatory fluid around the gallbladder mimicking acute cholecystitis. CT is regarded as a criterion standard in the assessment of a pneumoperitoneum. CT is useful in identifying even a small amount of extraluminal gas, particularly when plain radiographic findings are nonspecific. CT is less dependent on the patient's position and the technique used. 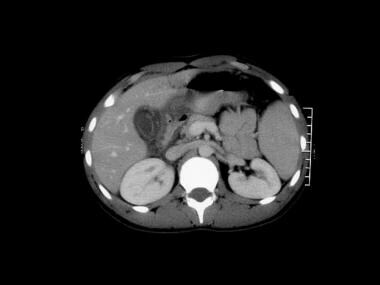 CT does not always help in differentiating between pneumoperitoneum of benign cause and pneumoperitoneum caused by a condition that requires urgent surgery. The anteriorly located gas from a pneumoperitoneum is sometimes difficult to differentiate from gas in a distended bowel. In addition, with CT, it is difficult to localize the site of the perforation. The presence of free gas in the peritoneum is nonspecific. It may be the result of bowel perforation, recent surgery, or peritoneal dialysis. Pneumoperitoneum can be seen as an area of low signal intensity on images obtained with all sequences. Pneumoperitoneum can be an incidental finding on MRI because MRI is not the primary imaging modality. The presence of bowel peristalsis can blur the bowel wall. Pneumoperitoneum. Scanogram obtained prior to CT shows the falciform ligament (arrow) and leakage of oral contrast medium (L) secondary to a pneumoperitoneum. Total sound reflection may occur at the interface of soft tissue and/or air. Reverberation of the sound beam may occur between gas and the transducer. High-amplitude linear echoes with distal artifactual reverberation echoes, which may be periodic, may be observed. The reverberation echoes are "dirty" in comparison with clear shadowing from calculi. Small reverberation artifacts have a characteristic comet-tail appearance. Small gas collections may show little or no distal reverberation artifacts with standard abdominal transducers (3.5-5.0 MHz). At times, the small gas bubbles are difficult to differentiate from microabscesses or microcalcification. The location of the gas collection is often the key to the differential diagnosis. Pneumoperitoneum is best seen around the perihepatic space in the supine or lateral decubitus position. Gas collection in the paracolic gutter is usually caused by GI perforation. Gas in a fistulous tract is usually associated with Crohn disease. Gas within a pelvic abscess is usually of GI origin; gas is unusual in PID. In cases of diverticulitis, extraluminal gas may be trapped within the adjacent mesentery. Portal venous gas may be seen as discrete gas bubbles moving toward the periphery of the liver with the bloodstream. Apart from gas in the liver, gas within other organs is usually secondary to an abscess. 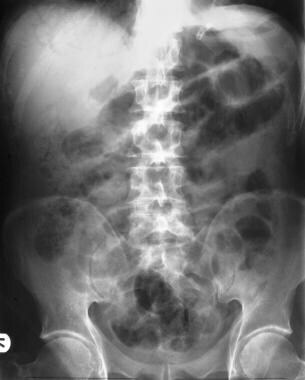 Normal intra-abdominal gas is intraluminal, with the surrounding bowel usually seen and associated with bowel peristaltic movements. In the appropriate clinical setting, the presence of gas bubbles within a complex fluid collection suggests an abscess. US is readily available in most centers. It is less expensive than CT, and it is particularly valuable in patients for whom a radiation burden is a major concern. These patients include children, pregnant women, and individuals of reproductive age. However, US remains operator dependent, and it is of limited use in obese patients and in those with a large amount of intra-abdominal gas. Knowledge of the abdominal anatomy, particularly peritoneal reflection, is critical for an accurate interpretation of gas in an abnormal location. US should not be considered definitive in excluding a pneumoperitoneum. Mimics of a pneumoperitoneum include shadowing from a rib, ring-down artifacts from adjacent air-filled lung, and colonic gas anterior to the liver-colonic interposition. Gas in the right upper quadrant may be confused with emphysematous cholecystitis, mural calcification, gallbladder calcification, porcelain gallbladder, adenomyosis, air within an abscess, tumor, biliary gas, or air within the portal vein. Intraperitoneal gas is frequently more difficult to detect than gas in abnormal locations because of adjacent intraluminal gas. However, even a small amount of free air can be detected anteriorly or anterolaterally between the abdominal wall and adjacent liver, where intestinal loops are not usually found. Differentiating extraluminal gas from intramural or intraluminal gas is difficult. Sureka B, Bansal K, Arora A. Pneumoperitoneum: What to look for in a radiograph?. J Family Med Prim Care. 2015 Jul-Sep. 4 (3):477-8. [Medline]. Braccini G, Lamacchia M, Boraschi P. Ultrasound versus plain film in the detection of pneumoperitoneum. Abdom Imaging. 1996 Sep-Oct. 21(5):404-12. [Medline]. Chen SC, Yen ZS, Wang HP. Ultrasonography is superior to plain radiography in the diagnosis of pneumoperitoneum. Br J Surg. 2002 Mar. 89(3):351-4. [Medline]. Baker SR. Plain films and cross-sectional imaging for acute abdominal pain: unresolved issues. Semin Ultrasound CT MR. 1999 Apr. 20(2):142-7. [Medline]. Grassi R, Pinto A, Rossi G. Conventional plain-film radiology, ultrasonography and CT in jejuno- ileal perforation. Acta Radiol. 1998 Jan. 39(1):52-6. [Medline]. Ottinger D, Swanson JR. Diagnosing intestinal perforation: a new approach. Am J Perinatol. 2008 May. 25(5):291-3. [Medline]. Stafford RE, McGonigal MD, Weigelt JA. Oral contrast solution and computed tomography for blunt abdominal trauma: a randomized study. Arch Surg. 1999 Jun. 134(6):622-6; discussion 626-7. [Medline]. Woodring JH, Heiser MJ. Detection of pneumoperitoneum on chest radiographs: comparison of upright lateral and posteroanterior projections. AJR Am J Roentgenol. 1995 Jul. 165(1):45-7. [Medline]. Williams N, Everson NW. Radiological confirmation of intraperitoneal free gas. Ann R Coll Surg Engl. 1997 Jan. 79(1):8-12. [Medline]. Cho KC, Baker SR. Depiction of diaphragmatic muscle slips on supine plain radiographs: a sign of pneumoperitoneum. Radiology. 1997 May. 203(2):431-3. [Medline]. Cho KC, Baker SR. Visualization of the extrahepatic segment of the ligamentum teres: a sign of free air on plain radiographs. Radiology. 1997 Mar. 202(3):651-4. [Medline]. Radin R, Van Allan RJ, Rosen RS. The visible gallbladder: a plain film sign of pneumoperitoneum. AJR Am J Roentgenol. 1996 Jul. 167(1):69-70. [Medline]. Markogiannakis H, Fili K, Spaniolas K, Bizimi V, Katsiva V, Theodorou D. Rigler sign: an underappreciated alert for pneumoperitoneum. Am J Surg. 2008 Apr 22. [Medline]. Chiu YH, Chen JD, Tiu CM, Chou YH, Yen DH, Huang CI, et al. 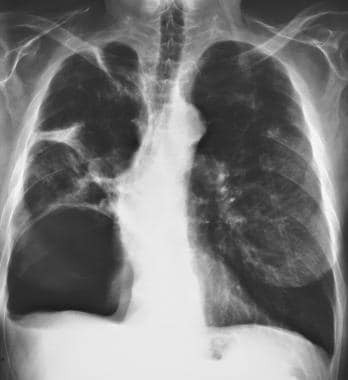 Reappraisal of radiographic signs of pneumoperitoneum at emergency department. Am J Emerg Med. 2009 Mar. 27(3):320-7. [Medline]. Menuck L, Siemers PT. Pneumoperitoneum: importance of right upper quadrant features. Am J Roentgenol. 1976 Nov. 127(5):753-6. [Medline]. Miller RE. The technical approach to the acute abdomen. Semin Roentgenol. 1973 Jul. 8(3):267-79. [Medline]. Baker SR. Unenhanced helical CT versus plain abdominal radiography: a dissenting opinion. Radiology. 1997 Oct. 205(1):45-7. [Medline]. Balthazar EJ, Moore SL. CT evaluation of infradiaphragmatic air in patients treated with mechanically assisted ventilation: a potential source of error. AJR Am J Roentgenol. 1996 Sep. 167(3):731-4. [Medline]. Chen CH, Huang HS, Yang CC. The features of perforated peptic ulcers in conventional computed tomography. Hepatogastroenterology. 2001 Sep-Oct. 48(41):1393-6. [Medline]. Earls JP, Dachman AH, Colon E. Prevalence and duration of postoperative pneumoperitoneum: sensitivity of CT vs left lateral decubitus radiography. AJR Am J Roentgenol. 1993 Oct. 161(4):781-5. [Medline]. Gayer G, Jonas T, Apter S. Postoperative pneumoperitoneum as detected by CT: prevalence, duration, and relevant factors affecting its possible significance. Abdom Imaging. 2000 May-Jun. 25(3):301-5. [Medline]. Sajith A, O'Donohue B, Roth RM, Khan RA. CT scan findings in oesophagogastric perforation after out of hospital cardiopulmonary resuscitation. Emerg Med J. 2008 Mar. 25(2):115-6. [Medline]. Chen SC, Wang HP, Chen WJ. Selective use of ultrasonography for the detection of pneumoperitoneum. Acad Emerg Med. 2002 Jun. 9(6):643-5. [Medline]. Chao A, Gharahbaghian L, Perera P. Diagnosis of pneumoperitoneum with bedside ultrasound. West J Emerg Med. 2015 Mar. 16 (2):302. [Medline]. The authors and editors of Medscape Reference gratefully acknowledge the contributions of previous author Sumaira MacDonald, MBChB, PhD, MRCP, FRCR, to the development and writing of this article.